HomeUncategorized The Young Athlete. Everything you need to know. With research suggesting that youth obesity and overuse injuries are on the rise, it would appear that the key elements of a healthy exercise routine are being missed. When comparing the extremes of physical activity vs inactivity, it is shown that neither outcome is favourable (1,3,8). Organised sport is a great way to get kids involved in exercise. It helps facilitate their physiological development, socialisation, self-esteem, and fitness. It also teaches them work ethic as they work towards a goal either as an individual or in a team. So when does a good thing become too much? In spite of their ability to bounce back quickly, kids still get injured. Due to their ongoing development, muscle, bone, and ligaments are more prone to injury in youth athletes with repeated use. Strategies can be implemented to prevent the risk of overuse training injuries through improvements in flexibility, strength, and neuromuscular control (1). Training volume is another factor that needs to be monitored in order to prevent such injuries and is often of greater concern for individuals that specialised in their sport from an early age (1,3). Early Sport Specialisation: What is it, and why is it a problem? Sport specialisation is defined as >8 months of intensive year-round training with the exclusion of other sports (3,4). The common belief is that by specialising in a sport earlier, you are giving them more opportunity to work on the skills for that sport, which will increase their chances of playing at a representative level, obtaining a scholarship, or a professional career in sport (3). Kids that play multiple sports have higher levels of athleticism, as they have developed a wider array of skill sets. It also decreases their likelihood of an overuse injury as they are not training the same skills year round (3,4,5). 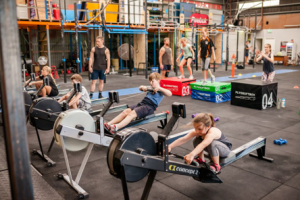 Beyond the competition, sport and exercise should be fun for kids, and if they suffer from burnout as a teenager, what’s their relationship with fitness going to be like in the years to come? Athletic development and sustainable training habits need to be prioritised in order to facilitate a healthy lifestylebeyondtheir youth. Kids need physical literacy. Physical literacy is the skills, knowledge and behaviours that give us the confidence and motivation to move throughout our lives (6). The FTEM Model is an approach designed by the Australian Institute of Sport (AIS). It considers the key aspects of youth’s physiology and training experience with the aim to provide the foundations of athletic development. The model can be broken down into 4 main categories (2). It recognises the different reasons in which people are engaged in sport, and the different levels they wish to attain; from just having a recreational pick-up game with friends, to representing their country on the world stage (2). The focus of the first foundational level of the FTEM development framework is on learning fundamental movement skills such as push, pull, squat, jump, carry, throw, hit and kick. The focus of this second FTEM level is to extend and expose a child to greater movement challenges in order to progress and refine their fundamental movement skills. This level commonly is the beginning of most club-based sporting experiences. An opportunity to engage kids in formal or informal competition and explore their skills in game scenarios (2). You can read more about the subsequent levels of the FTEM frameworkat the AIS website. The dominant themes for Long Term Athlete Development are to make exercise fun and to let your child explore as many different avenues of movement as possible, for as long as possible. Gymnastics may be one of the few exemptions from this, where peak athlete age appears to be much younger (3,4,5,6). Don’t worry, I get it. You’re already the designated taxi driver and don’t have time to drive your child to half a dozen sports. 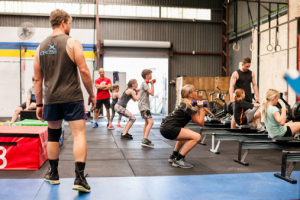 Fortunately for you, CrossFit has taken the liberty of combining all of the great attributes needed for physical literacy and put it in your one-stop shop. 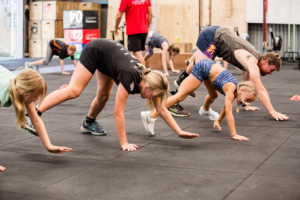 CrossFit Kids and CrossFit Teens embody the FTEM framework, as it exposes and develops the range of skills at the foundational level. 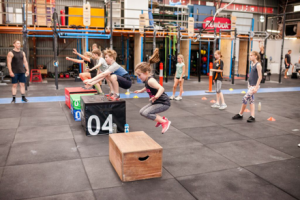 Furthermore, the wide range of activities that are explored in CrossFit Kids can reduce their chances of developing overuse injuries as they make improvements in flexibility, strength, and neuromuscular control. Strength training with the guidance of quality coaching is not only safe for children, but recommended, and is a great introduction to the process of training (1,3,5,7). Obviously, we want to keep children active. It is my hope that with some of the information above you can make an informed choice about your child’s athletic future. One that aims to promote a fun and healthy lifestyle, and encourage physical literacy above short term performance. Arnold, A., Thigpen, C., Beattie, P., Kissenberth, M., & Shanley, E. (2017). Overuse Physeal Injuries in Youth Athletes. Sports Health: A Multidisciplinary Approach, 9(2), 139-147. Feeley, B., Agel, J., & LaPrade, R. (2015). When Is It Too Early for Single Sport Specialization?. The American Journal Of Sports Medicine, 44(1), 234-241. Commonwealth of Australia. 2010. Taking Preventative Action – A Response to Australia: The Healthiest Country by 2020 –The Report of the National Preventative Health Taskforce. Australian Government: Barton.